Many of you might think that low-calorie diet means chewing bland foods that hardly have any taste. With the increasing concern regarding weight loss, everyone is trying to find new recipes that are low on the calorie count yet high on the taste quotient. If you think that your weight loss menu will be too cruel on your taste buds, then it is time to give it a second thought. Soups can be the ideal addition in your diet chart as it can be prepared easily and digested and absorbed in the body without much effort. The fresh vegetables and spices also add a high nutritional value to it. So, to simplify your diet plan, here are three recipes of soups along with the calorie count. Check these out and pamper your taste buds. This thick green vegetable soup can be the ideal choice for your low-calorie lunch. Vegetable stock, 1 tbsp sunflower oil, 2 sliced garlic cloves, small piece of sliced ginger, small grated turmeric, pinch of Himalayan salt, courgettes, broccoli, kale, lime juice and parsley for garnishing. At first, stir-fry the garlic, ginger, coriander and turmeric with a little bit of salt in the frying pan and then sprinkle some water on it. Then, put the courgettes inside the frying pan and stir it well to mix with all the spices. After cooking it for 3 minutes, add 2 cups of vegetable stock and leave it for another 3 minutes. Then Slide the broccoli and kale along with the lime juice into the pan. Cook it for 3-4 minutes and then smoothen it in the blender. Serve with roughly chopped parsley leaves. 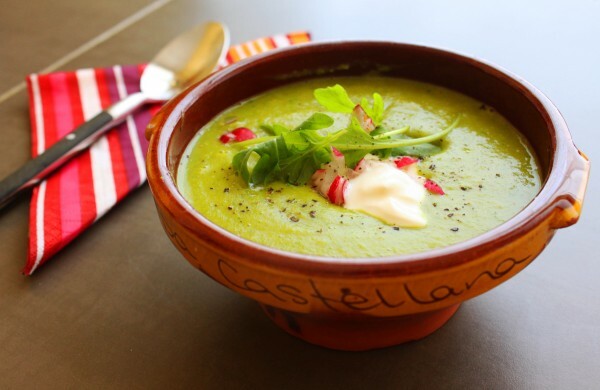 This tasty green soup amounts to 182 calories with 10g protein, 14g carbohydrate and only 8 grams of fat. Due to the presence of fiber it can be easily metabolized. This easy-to-make soup can be your favorite breakfast. Black beans in a generous amount, tomatoes, 2 tbsp chicken stock, 1/4th cup of salsa. Take all the ingredients and mix them all in a blender. Put the mixture inside a cooking pan and heat the pulp. Garnish it with grated cheddar cheese if you want to make it tastier and good looking. With 365 calories, it can be a power-packed meal with which you can start your day. 22 grams of protein will fill your stomach and will be easily digested as well. Now, if you want to dine with a tasty soup, then this one can be the best with pea and mint. Check out the recipe. A bunch of spring onions, 1 peeled and diced potato, 1 crushed garlic clove, vegetable or chicken stock, fresh peas, chopped fresh mint leaves, caster sugar, 1tbsp juiced lemon, 150 ml buttermilk. Take a large pan and put spring onions, potato and garlic with the stock inside. Simmer until the potato is cooked and becomes soft. Set aside some blanched peas for garnishing and put the rest inside the bowl and cook for 5 minutes. Then, add the buttermilk along with the mint, sugar and lemon juice. Stir it well and relish with a little bit of sourced cream. It contains 108 calories which is perfect for dinner. The best thing is that, it has only 1 gram of fat. These are the three simple soup recipes for the three main meals of your day. Choose any one from these low-cal delicacies and satiate your taste buds! ← Check Out What Top 5 Celebrities Say About Their Exclusive Breakfast Routine!